As I inferred previously, it is very important to me that engineers and engineering principles are at home in BCS. They are a critical component (but not the only component) of what this field actually is. He insists that The Lad is in error. Computing is sometimes pretty abstract, but not as disconnected from the physical as you suggest. Code is at the end of the day not abstract mathematics, but instructions that will be transduced into physical effects in both light and matter. By definition, code designed to be run will have a physical impact. It can also be argued as the application of computer science, and as such gets back to the core of engineering as the application of science (though predicated of course on computer science being an accepted term). Through those arguments, and potentially others, software engineering is full-blooded engineering, and benefits from the application of the well-developed fundamental principles of engineering common across all fields. The Lad notes that his definition of engineering is not the ‘application of science’ but the ‘manipulation of forces’ [for the benefit of human kind]. Thus it is in the earliest days of the Athenian Navy trireme and Roman aqueducts, engineering existed before they had the benefit of science as we currently know it. I’d also challenge whether the entire body of what you’re currently calling engineers would be comfortable with the suggestion that they are so disconnected from organisations and people. I think both from a design and implementation perspective, people (their behaviours, the impact on them) are often very important to engineers and engineering projects. This is a valid point that he had not made plain. The truth is that any engineering project has to take proper account of the ‘human environment’. Otherwise it will be deemed, correctly, a failure. [It] Complements and combines mathematical and engineering thinking. Computer science inherently draws on mathematical thinking, given that, like all sciences, its formal foundations rest on mathematics. Computer science inherently draws on engineering thinking, given that we build systems that interact with the real world. The constraints of the underlying computing device force computer scientists to think computationally, not just mathematically. Being free to build virtual worlds enables us to engineer systems beyond the physical world. 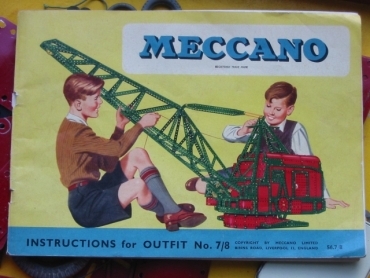 Meccano and proto-engineers go together in the world view of the generation of The Lad’s father. In this ancient view, it was a pre-requisite that all engineers originally wore the short trousers and built models in Meccano of such unlikely complexity as the Forth Bridge or a Steam Shovel see below and a previous post. This work has been released into the public domain by its author, Steve Johnson. This applies worldwide. Gulp! Do such echoes of Wilkes and a previous generation persuade The Lad that the origins of IT involved engineering, albeit of the model genus? Would he have to alter his stance on the variable relationship between IT and engineering? Ah, yes. We know what to say… No change in the IT stance – because Wilkes’s machine was analogue. Moving quickly on. There was a BBC2 “Engineering Giants programme on Sunday 15 July 2012. It was the first of a new series exploring how large machines work. The programme watches, in the words of the Sunday Times, a 14 year-old Boeing 747 jumbo jet being taken apart and re-assembled. In engineering reality, it really means that it was stripped down, examined, repaired as necessary and re-assembled. It was a pretty good programme considering the dearth until recently of programmes addressing any sort of engineering. Let there be more such. Pity they called everyone in shot ‘engineers’ when all [except two presenters] were technicians. Yes, all were of the engineering profession. There are many in the profession but not all are engineers. The aircraft designers and those who specify the test standards [none of whom appeared] are the engineers. Though both are members of the ‘medical profession’ no one refers to nurses as doctors or vice versa. Solicitors and barristers are distinct members of the legal profession. So to are, in the engineering profession, engineers, technicians and mechanics amongst others. They are not to be confounded. Oh Lord! I’m tiring! Let us leave that battle to another day. The Lad suspects that this thread is running out of steam for the moment or, at least, running the risk of trespassing on the goodwill of our reader. She needs a return to a post on ‘engineering-engineering’ and away from ‘name-engineering’. We can come back to it when there is something more to add. Let The Lad move on for the moment to the next post on the swimmer. Then why not “Dyson Lab”, or Lovelace, Faraday, Bamford? The great composers of classical music are celebrated as intellectually subtle, with wide achievements that buttress our civilisation, and enrich our culture. A series of ‘Schubert Lab’ programmes recently on Radio Three featured experts and were for the interest of the lay–person. They spoke of the keys and chords; not in general but digging deeply into named pieces of music,. The programmes must have totalled something like 3 hours over 8 days in a Schubert strand that was 200 hours overall. One of them, for example, discussed Schubert harmonies. Laura Tonbridge, an academic, spoke to Tom Service of a song that describes a journey and then he went to the meta-level by suggesting the journey that ends six years later as another song also about a journey. Then Jonathan Cross, a pianist talked about harmonies in another song that “sets up the home key of E minor ….. and then suddenly just by changing one note he moves the bass down a semi-tone and ….the [whole song] as if flips through the other side of a mirror”. This is no aberration: many programmes scattered throughout the 24 hours on Radio Three operate at this level. It is powerful, technical, professional stuff with no patronising. There is no pandering to an audience that is without knowledge of music theory and notation; it is aimed at those who revel in subtle, new ideas. No dumbing-down here then. And – it’s before the watershed. The great engineers are equally subtle, with wide achievements that buttress our civilisation, and enrich our culture. Yes. Yes, alright! So too are scientists. If this is a disturbing, unacceptable idea, it is because we hear in our education and the media so little of the detail of the engineers’ work, achievements and satisfactions. There is, in this field, nothing similar to the Schubert Lab other than, possibly, ‘The Material World’ on Radio Four. Why not have expert, practising engineers speaking of their work, the whys and wherefores? The Dam designer could describe what the choices are in choosing the type of dam [concrete arch, earth], how to build it without it being washed away as fast as they work, and what she has to consider before the water is finally held back. A contemporary engineer can describe fibre composite materials and their unusual, non-isotropic properties and what he applies them to. The discovery or invention of stainless steel has tremendous resonance in the modern world. There are many others to choose from. Some stories could be told by the engineer responsible, others from longer ago could be related by an insightful, modern engineer. There will be intensely satisfying Eureka moments. It even happens in Mathematics: how many have heard how Poincare had his? He was working on a theory in complex functions and a massive insight came to him just as he stepped up onto the platform of a bus. Its connection to non-Euclidean geometry rose from his subconscious like the filmic Jaws from the sea. It’s the Arrêt De Bus Poincaré now. Where is the Commissioning Editor – OK. – for Radio Four or BBC Four perhaps? Posted on April 2, 2012 Categories UncategorizedLeave a comment on So! “Schubert Lab”? STOP PRESS! – Free Power! We interrupt this thread on the helicopter briefly to mention the latest saver of the Planet. The Searaser and some of its simpler engineering aspects. The fact that the media say that it works like a bicycle pump does not induce confidence. The inventor’s backers Ecotricity [http://www.ecotricity.co.uk/our-green-energy/our-green-electricity/and-the-sea/searaser] call it a double acting pump. It cannot be both. Virtually all bicycle pumps only push air into a tyre on the inward stroke; that is, it is single-acting. A double acting pump pushes its fluid both on the inward stroke and the outward stroke. The Lad has to wonder how reliable such an arrangement can be as it flops around in the turbulence of the open sea. The pump and the float will each be subject frequently to different forces tending to flex the assembly. Even if the float and pump themselves can withstand these forces without failure; the piston rod seal at the pump will see large leverage forces. They will tend to make it leak or, at the least, make for inefficiency due to high friction. What is the L/D ratio for the bearing? Speaking of friction, how much power at the pump is wasted through friction losses pushing the water through pipes from the pumps miles out at sea all the way to the land and its power generating turbines? Each pump cannot be scaled up beyond the scale set by the sea wave length. If it is built much bigger than, say, one or two wavelengths like a ship, it will become stable – like a ship – and not move up and down at all or very little. Full engineering design and development details cannot be expected to be given in the press. It seems clear to The Lad though that there is a very long way to go before the engineering production model is workable. Even then the economics will still be an unconquered enemy. Note also that a reservoir is needed on land at a suitable height. This is to provide enough potential energy to generate a useful amount of power whilst not needing too much pressure head. Too high a working pressure for the system will lead to even more design problems. The storage of water in the reservoir is also needed to smooth out the variations in pressure inherent with an oscillating pump and also to provide some back up for these days, and they undoubtedly exist even in the UK, when the waves are small or in a flat calm. But again, how big will the reservoirs need to be for every pump farm to provide continuous power and not have its beneficiaries sitting in the dark. After all the UK weather is known to everyone to vary from day to day. There tends to be a comparable number of weather states that are “too much” or “too little” as there are that are “Goldilocks”. The video shows the first model giving some squirts of water that are, not to put too fine a point on it, not very big. Perhaps that is the origin of the Bicycle Pump name. Later models seem to give a better flow rate, it has to be admitted. Nonetheless, still the supporters of such proposed systems still cannot show, even if they understand it, the gigantic amounts of unremitting, 24/7 power generated by the Base Load Power Stations for a modern society. The Lad is aware of an existing water power generating scheme on a nearby, quietly flowing river. To see the amount and velocity of the outflow which generates only 150kW is a reality check on the water flow and plant required. This is how it can, more realistically, be done. Visit here to see something of it; http://www.derwent-hydro.co.uk/our_sites/index.html . The Lad has no connection at all with this small organisation. So, assuming that much can be done to develop the system, how many fully-engineered assemblies would be needed to generate, say, a megawatt hour of electricity? What is the cost per unit of electricity from such assemblies at the Grid? Posted on January 25, 2012 Categories UncategorizedLeave a comment on STOP PRESS! – Free Power! A live, engineering topic in this environmentally conscious time is how to reduce the carbon footprint of the various methods of producing electrical power; coal, oil, nuclear, wind, tidal and so on. Coal fired power stations are regarded as very polluting because an unavoidable by product of the combustion of coal is carbon dioxide. Carbon dioxide is a greenhouse gas widely regarded as bad for the environment. There are, though, apparently still large reserves of coal globally available close to some regions with a high demand for power. For other areas further away it is economically transportable. The extraction cost is quite reasonable compared to some other sources of energy. If the emissions problem could be solved there would be some potential economic benefit if coal could be used. Thus it is that some projects are looking at ways to reduce or eliminate the problem of carbon dioxide emissions. This is where the idea of Carbon Capture and Sequestration [commonly known as CCS] comes from. See the diagram above. This project, or series of alternative projects, will have many problems in addition to the engineering ones. However the engineering is what will feature in a simple way in this post. The project, as does the engineering, has two flavours although they overlap a bit: petroleum engineering and chemical engineering. What is this CCS; what does it need to do? Whole textbooks and complete journals of technical research papers can and will be devoted to the projects. In this post we can only touch upon the first, major challenges in the simplest possible way. The Lad is using his engineering judgement and that without close experience of the problems. He apologises to the engineers struggling in the field if he does not do justice to their work. Please add your comments and enlighten us. 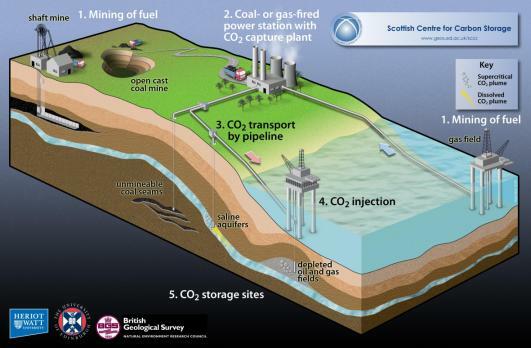 The carbon capture phase is one of chemical engineering whilst the sequestration draws upon much oil-drilling technology, which is petroleum engineering. The gas fumes normally pour from the Power Station chimney as a fast-flowing mixture of carbon dioxide, CO2, and many other gases and particulates. From this we must remove the CO2. We could scrub the fumes in some fluid. Try an analogy here. You pour sugar [equivalent to the CO2] into a cup of tea [the scrubbing] and the sugar dissolves. Imagine that the sugar also bonds with the tea molecules. This is equivalent to passing the gas fumes and grabbing all the CO2 and holding it back whilst the remainder continues on. That’s easy enough with tea and sugar and not quite so easy with CO2. But that’s only the start of what the engineer has to arrange. Now she has to get the sugar out of the tea again. That’s stripping the CO2 out again. That’s carbon capture and quite a clever trick but chemical engineers perform clever tricks all the time. Then there’s the sequestration. All you have got to do is to take the CO2 somewhere and bury it. How does this grab you? Say, drive it out to the middle of the North Sea – and The Lad means DRIVE it using a lot of power – and 10000ft down. Think of doing all this at a rate of about 2000 tons an hour. Do it reliably and without hesitation for every hour. 24/7. This is for 1000tons of coal per hour, taking from the atmosphere and binding to a similar amount of oxygen. This is for one power station alone. There are, of course, other power stations. Engineers have faced bigger problems. Not many, The Lad admits, but some. Think of Nuclear Power Stations, big bridges, rockets to the Moon and back, and tunnels. Your modern group of engineers on being presented with this project will smile slowly. “OK.” they’ll say, “Let us at it” They are facing their old enemy: the forces of nature in several of their myriad forms. They have to overcome forces to pull the CO2 out of the flue gas. Then overcome those forces again to pull the CO2 back out again after the stripping process. Then they have to force again the CO2underground into the tiny pores in some rock. Stripping is taking a lot of power to achieve. Problem one is to need to use less power than the Power Station is generating. The Lad supposes that that’s obvious enough. Well, obvious or not it does not make it easy to achieve. If it takes a lot of power to do, maybe they will try to find a catalyst to reduce the required power. In many chemical processes where compounds interact beneficially it may, naturally, proceed quite slowly. However, some chemical compounds speed up the process solely by their presence and, by the end of the process, are still present and unchanged. You could regard such catalysts as being a form of lubrication of the process. There is a catalyst in your car doing a similar job to clean up your exhaust [but not CO2]. And that is platinum or something similarly expensive. The Lad is willing to bet about another of the problems. Problem two is, he is willing to bet, the process will need high pressure to work. The engineer tries to design such chemical plant out of steel because it is less expensive than most other materials. So add to that, Problem three. CO2 frequently morphs into carbonic acid which is nasty and corrosive to most steels. Unless you take great care in designing your plant pressure vessels and piping, this is like taking a pin to a balloon. Most of the mentions in the media so far have told me only that sequestration consists of putting the carbon into porous rock underground. There is nothing on the carbon capture phase of the process. The media do not have engineers, you see. They do not understand much of the problem. Correction, they do not understand any of the problem. This is from ‘World Resources Institute, a US based ‘thinktank’. They claim that they are independent. The WRI first video mainly [most of the 5 min video – but not all] speaks of the injection process, not of the capture and sequestration processes and any difficulties thereof. This study project is coming to an end with a Feb 2012conference in France. A step in the long road. Give thanks to the Sunday Times in the 23 October 2011 issue, or more especially Joe Watson of Swansea, for a letter that moves a little way down the road. That is the road to an understanding of engineering reality by the general public and those thinking about choosing a career. Mr Watson rightly chides a previous writer for suggesting that engineering is a manual job. His own definition of the properties of an engineer is hard to better. The engineer is a ‘graduate who has competence in physics, mathematics, IT and design – to mention a few’. This is not true of the tradesmen or women who are the artisans. While this tells us what they are, and is fine as far as it goes, it does not tell us what the engineer actually does. But, fair do’s, it is progress. Why, though, is such a simple definition still necessary in the modern world? Think about this. The distinctions between patients, doctors and nurses and even finer graduations such as Registrar or consultant seem to be quite clear to everyone. The Police uniformed branches and its sub-branches compared to the detectives are well-known. Is it because each of those professions is the subject of a vast number of programmes on television? Is that the reason: people learn through the TV stories? The Lad will not support this as he does not want to encourage the already over-mighty, super-confident denizens of that medium. No, the ignorance is more likely to be because the general public does not normally come into any contact with engineers in person or read about them. Yet, for goodness’ sake, they come into contact with their products every hour of every day. Perhaps this blog will add a few bricks so that the profession rises into view a little more. Posted on October 26, 2011 Categories Engineers in the World, UncategorizedLeave a comment on A step in the long road. Something has come up. It means that we must re-visit the post on the old and new diggers. The trigger for this was the comparison drawn by The Lad between the old, 1935 Quarry Shovel and one modern machine that JCB, its maker, calls a Tracked Shovel. The Lad is not a student specifically of heavy earth movers so he made a couple of assumptions as he wrote the post. One assumption was that if a particular design was in a museum; it no longer, shall we say, appeared in the wild. The second assumption was that a large manufacturer of current modern earth movers will produce all the different types. A little further browsing soon showed both to be in error. Caterpillar Inc is a very large, US based company specialising in Mining equipment. Its catalogue soon revealed to the surprised gaze of The Lad the error of assuming that the Museum machine had become extinct. There were some machines they now called Electric Rope Shovels. Here are some pictures that you can find along with much more data at https://mining.cat.com/cda/layout?m=435120 . Look familiar? Apart from the trebling or even quadrupling in size [note the size of the control cabins in all three and the access stairway in the third machine], these modern machines are still of the same design or general architecture as The Abbey Pumping Station Museum Steam Navvy. The increase in size of these modern machines brings with it a major increase in strength. The machine in the first image above is the smallest of the range and the load capacity of the dipper is 20 tonnes whilst that in the third image is the largest and its payload is a mere 120 tons. The latter machine itself weighs in at well over 1000 tons. The market for such machines across the globe is probably not large and so accounts for the second assumption of the previous post being in error as such an enthusiastically commercial company as JCB declines to make such machines. Engineers still have to operate and try to turn an honest profit in the global marketplace. The engineering aspects of the replacement of steam with hydraulic rams for machines of the size of the Ruston Bucyrus Quarry Shovel of 1935 is, however, still absolutely true. But there is more to it than that. First of all we have to be clear that those two machines – old and new – were not designed for the same objectives. However, The Lad is getting side-tracked again: let us return to the diggings. The old machine reigned in quarries and opencast mines. It had as its objective the removal of large quantities of the ore which is the stuff that you want – pay dirt. Or, first, the overburden, which is the dirt or rock covering the ore. The new Tracked Excavator has as its main design objectives a somewhat different type of task. It is to carry out landscaping [shall we say – engineering of the shape of an area of land] or carving out trenches. Its workplace is the brown or green-field of a building site; the route of a new road. That is not to say that it cannot turn its hand to removing ore or overburden it is just that it is not designed exclusively for this task. The modern Electric Rope Shovel also has as its home the quarry and open-cast mine although many of these are now much larger than they used to be in the first half of the Twentieth Century. This, of course is the driver of the design of the modern Cat machines. Why do they not use hydraulic rams? There will be a limit to the operationally effective length of a hydraulic ram due to its method of manufacture. The Lad does not know for certain, but he suspects that it is limited by the size of grinding machines for the bores and rods of the ram. [Perhaps someone will comment and correct him if necessary.] If the machine design needs to exceed that limit, then other methods have to be used or, perhaps in this case, sticking with the old ones. The Lad believes that the geometry of the jibs and big machines required rams too long for effective manufacture and the pull of cables became a good principle to retain. With the use of cables, the original architecture was not easily bettered. Then there is the ‘electric’ of the title Electric Rope Shovel. It is electric powered too. The prime mover is not mounted on board and lugged around. It is firmly ground based somewhere in the mine. It will be large, heavy – and efficient – power generator. Power is supplied to the Shovel by cable. Beware as an engineer of assumptions. The Lad does not say that in the day-to-day engineering assumptions will never be made. Sometimes to allow the job to proceed, they have to be made. Just make sure that they are robust. Then, never let the assumptions drift on as correct; check their correctness properly as soon as possible. Caterpillar Inc has just this year completed a takeover of another earthmoving machine firm. It was that firm, not Caterpillar Inc, which designed this giant Shovel. The name of that other firm was? Bucyrus. Does the name ring a bell? It is the US company that licensed the UK firm Ruston in the 1930’s to build the 52B Steam Quarry Shovel.